Culinary maven Jennifer Eremeeva bids farewell to summer and the temporary watermelon kiosks in Moscow by combining two quintessential Russian flavors: sweet melon from the south and salty brynza cheese. Summer ends quickly in Russia. Come September 1, as children head back to school, you can discern a palpable change in the air: a shift to crisp and autumnal. And even if fall draws out into a balmy and leisurely babye lyeto or Indian summer, the light and air are still somehow different. The leaves obediently begin their metamorphosis from green to yellow and the nights draw in. Soon it will be time for the watermelon hawkers to dismantle their temporary cages and kiosks and head back down south for the winter. I’ll be sad to see them go, as more than anyone or anything else, they take summer away with them definitively. In early August, the hawkers and their succulent wares traditionally make their appearance in Northern Russian cities, as they make their way up from the southern regions around Volgograd and Astrakhan with their pink and green bounty. Seemingly overnight, every street corner boasts a cage or truck with piles of bright green watermelons, and Russians eagerly inaugurate melon season. This summer’s crop inspired Moscow chefs to particularly innovative flavor pairings. Some of my favorites were poured from cocktail shakers all over town: I sampled raspberry and watermelon margaritas, a watermelon mojito, a delicious watermelon and cucumber (who knew?) cobbler, and a seemingly endless combination of watermelon and vodka: in granita, in sorbet, and in the time-honored Russian tradition of injecting a whole watermelon with a syringe full of vodka and allowing it to marinate overnight. The result is a lethally tipsy dessert and a universal favorite at the end of dacha season. HRH (my “Handsome Russian Husband”) and I enjoyed our fair share of watermelon this summer, and I tried to be a bit more creative than just cracking open the melon and serving it with a thick roll of paper towels. I tried to grill it, which I don’t recommend, no matter what Martha Stewart says. I juiced it and made popsicles, which I do recommend, and I put it front and center in a number of summer side salads as an accompaniment to grilled meat, poultry, and fish. By far the most popular was this simple, but delicious and very visually pleasing salad, which pairs watermelon with salty Russian brynza, an Eastern European version of brined sheep’s cheese, which is similar to feta. The two flavors go beautifully together, and are brought together perfectly with a little red onion and Serrano chili for heat and bite and a tangy but sweet lime and pomegranate syrup. Mint completes the ensemble for a quick and easy salad that looks as great as it tastes. The crucial step in this simple recipe is to allow the watermelon pieces to drain sufficiently — I recommend at least one hour, and better two. If you omit this step, the onion and Himalayan pink salt will cause the watermelon to leach its excess liquid into the salad, which will make the salad both soupy and mushy. Draining will ensure that the watermelon is the right degree of crunchy. 1. Cut the watermelon into chunks, or use a melon baller to create small melon balls. Place the watermelon in a colander, sprinkle it with the table salt and set over a bowl or on a draining board. Let it sit for 1 hour to allow the melon to drain. This is a crucial step to keeping the salad from being too mushy. 3. Combine the lime juice, olive oil, pomegranate syrup, and Serrano chili in a food processor fitted with a steel blade and process until combined. 4. 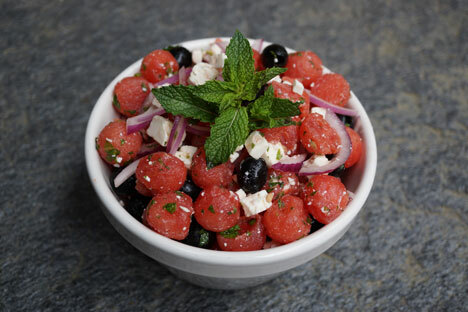 Toss the watermelon with the brynza, olives, diced onions, and most of the mint. Drizzle the dressing over the salad and garnish with the remaining mint and Himalayan pink salt. Jennifer Eremeeva is an American writer who has called Moscow home for twenty years. She is the author of Lenin Lives Next Door: Marriage, Martinis, and Mayhem in Moscow and Have Personality Disorder, Will Rule Russia: A Concise History of Russia. She writes about Russian history, culture, everyday life and humor, and food at http://jennifereremeeva.com.